Unsure of materials or brand. Sound dampeners for cymbals and hi hats. Not the best way to outfit your kit for quiet practicing but they do make them much quieter. The cymbals won't feel or sound like cymbals but they'll definitely be quieter. The pad that goes in between the 2 hi hats is probably the most effective one as it can still sound a bit like the closed hi hat chick sound when played with the pedal (depending on the size of the hi hats relative to the size of the pad). 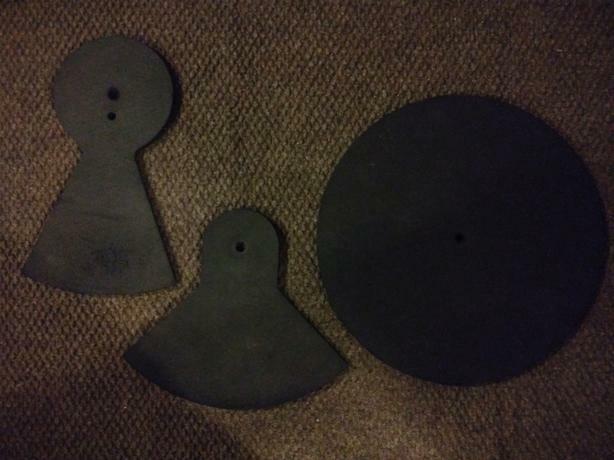 3 pads- one for top hi hat cymbal, one to go in between the 2 hi hats (or could be used on a drum- although it has a small hole in the center for the hi hat rod) and one to be used on a ride or crash cymbal. The one for the top hi hat cymbal has one attachment hole and fits a 14" cymbal but could possibly work okay on smaller sizes of hi hats and could work on a 14" crash or ride. The one for the ride or crash has 2 attachment holes and would fit a 16" and 18". The one that goes in between the hi hats I think is designed for 14" hi hats but is slightly under 14". I think this is on purpose to allow the edges of the hi hats to still touch when closing. Unsure of brand and unsure if they were purchased as a package, through 2 purchases or individually. Will sell all 3 together or the 2 hi hat pads separately from the ride/crash pad. Not sure how old they are but likely purchased about 10 to 15 years ago.Used moderately and in mediocre condition. They weren't played on that much but I think because of age the material is starting to shed when you rub it (i.e falling apart). I'm not sure if impact will cause the problem to worsen or if it mostly just happens when rubbing the material. Should definitely be able to get some mileage out of them- just not sure how much.